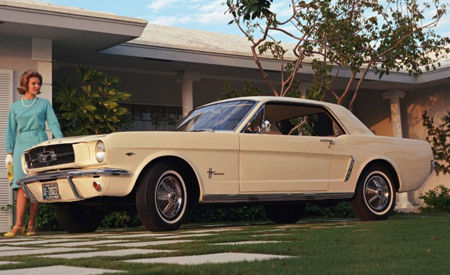 Will Ford Unveil New Licensed Repro 1965–1966 Mustang Bodies SEMA 2011? The 1967-1970 Ford Dynacorn bodies have been around now for a few years. They’ve done well in making restorations available and affordable for many more people. But news this week points to the possibility of even more bodies to add to that list. That’s right, Ford look set to release officially licensed 1965 and 1966 Mustang Bodies. The below sneak peak to this years SEMA show in Las Vegas hints that we may see 1965 and 1966 coupe and/or convertible repro bodies. The SEMA show runs from November 1 through 4 in Las Vegas. © 2011, 1967 Ford Mustang Shelby GT500. All rights reserved. This entry was written by by 67mustangblog.com (1967 Ford Mustang Shelby GT500) and posted here on Wednesday, October 19th, 2011 at 12:45 pm and is filed under dynacorn, ford, ford motor company, Thoughts. This article was not written by us, rather gathered using RSS feeds listed here. We take no credit for this article. You can leave a response, or trackback from your own site.